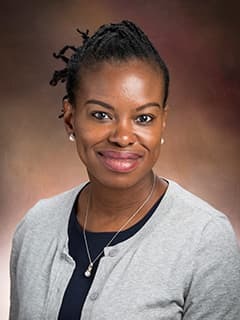 Olufunke Afolabi-Brown, MBBS, is an attending physician in the Division of Pulmonary Medicine at Children's Hospital of Philadelphia. Olufunke Afolabi-Brown, Michael Marcus, Irina Kazachkova, Kathryn Fitzgerald, Jessica Erkman, Ripple Sandhu, Peter Homel, Mikhail Kazachkov: Childhood Obesity, Pulmonary Function And Airway Hyperreactivity. Am J Respir Crit Care Med May 2015. Afolabi-Brown O. Respiratory Failure, Septicemia/DIC/HUS as a Presentation of Cystic Fibrosis in a Child with Homozygous S549 mutation. Presented at: American Thoracic Society conference; 2016 May; San Francisco, CA. Afolabi-Brown O. Central Hypoventilation Syndrome. Grand Rounds presented at: St Christopher's Hospital for Children; 2016 Mar; Philadelphia, PA.
Afolabi-Brown O. Pediatric Pulmonary Disorders. Presented at: Department of Physician Assistant studies, University of the Sciences; 2016 Feb; Philadelphia, PA.
Afolabi-Brown O. Pediatric Pulmonary Disorders. Presented at: Department of Physician Assistant studies, University of the Sciences; 2015 Feb; Philadelphia, PA.